What affects CT scanner service pricing? Age: The rule of thumb is; the older the unit, the cheaper it is to service. Parts become more available on the secondary market and there are more engineers available that have built experience on the equipment. Of course, there is also a point where a system becomes so old that it can be difficult to find parts. This is a rare scenario, however, as even equipment that is no longer supported by its manufacturer can be supported by the secondary market. A facility would need to hold onto a system for an exceptionally long time for this to happen. Location: A scanner in a remote location will be more expensive to service. The service provider will consider their engineer’s costs for lodging, rental cars, fuel, plane tickets, etc. as they build their quote. The closer the engineer, the lower the travel expenses for the service provider. Parts: This is an area of concern for any service provider. Parts inevitably fail and need to be replaced. If a part is hard to find, you can bet it is more expensive to buy. A good example is replacement X-ray tubes. Some are only made available from the OEM. This is the most expensive option and the service provider will factor the risk of replacing that part into the final number. Coverage Options: Similar to car insurance, the more coverage you get, the higher the price. Adding coverage for accessories or typically excluded components is an added risk to the service provider and the overall service price will be higher to cover that risk. Make & Model: Some systems are easier to service than others. This ease lowers service pricing. 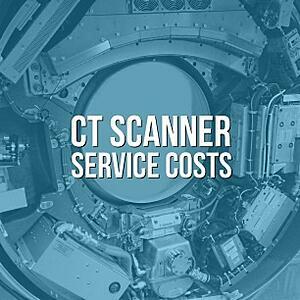 For example: GE CT scanners are typically less expensive to service in the USA because parts are more readily available. Plus, because there are so many GE units out there, there are more engineers to service the equipment. Multiple Systems & Multiple Years: Expect to get lower service costs per system if you buy for multiple systems at the same time. Similarly, adding more years to a service contract often yields a lower payment per year. In light of the variables from the list above, here is an idea of what you can expect in CT service prices. Please note that these numbers reflect average costs for comprehensive full service coverage agreements. Time and materials service options are available, but costs will vary widely depending on the work that needs to be done. After you assemble the information above about your system and your site, prospective service providers will be able to give you much more accurate quotes for taking your CT scanner under service. If you already have this information, the Block Imaging Service Team is happy to begin working on a custom quote for you right now! Use the button below to tell us about your needs and get pricing information quickly. Stephen Loomis is the Service Account Executive at Block Imaging. He loves to help imaging facilities maximize their uptime with informed decisions about equipment upkeep. Outside the office, Stephen is a husband and father, musician/songwriter, and unique hat and footwear aficionado.